YESTERDAY I tried to draw the line between those sensory experiences which belong to the upper man, constituting man's essential soul life, and those which are more connected with the lower man, the content of which stands in much the same relationship to human consciousness as external experiences proper, only that these experiences take place within man. We have seen that the ego-sense, the sense of thought, the word-sense, the sense of hearing, the sense of warmth and the sense of sight are all experiences of the former kind, and that we then plunge into two regions in which man's inner experiences resemble external experiences so far as his consciousness is concerned; these two regions are, first, the senses of taste and smell, and then the other four, the inner senses proper. You see at once how difficult it is to make do with the rough and ready terms which are suitable enough for descriptions of the external world, but quite inadequate directly one comes to consider the being of man and the structure of the world within him. But at all events, if we are quite clear about this distinction between the upper and the lower man, both of which in a certain way are representative of the world-process, we shall also be well aware that there is a cleavage in our experience, that our relationship to the one pole of our experience is utterly different from our relationship to the other. Unless we grasp this division of the human being thoroughly we shall never reach full clarity about the most important problem of the present and of the near future, the problem of the relationship of the moral world, within which we live with our higher nature, within which we have responsibility, to that other world with which we are also connected, the world of natural necessity. We know that in recent centuries, since the middle of the fifteenth century, human progress has consisted predominantly in the development of ideas about natural necessity. Humanity has paid less attention in recent centuries to the other pole of human experience. Anyone who is at all able to read the signs of the times, anyone who knows how to recognise the task of the times, is quite clear that there is a deep cleft between what is called moral necessity and what is called natural necessity. This cleavage has arisen primarily because a great many of those who believe themselves to represent the spiritual life of to-day distinguish between a certain sphere of experience that can be grasped by science, by knowledge, and another sphere that is said to be grasped only by faith. And you know that in certain quarters only what can be brought under strict natural law is acknowledged to be really scientific; and another kind of certitude is postulated for all that falls within the sphere of the moral life, a certitude which only claims to be the certitude of faith. There are circumstantial theories as to the necessary distinction that has to be made between real scientific certainty and the certitude of belief. All these distinctions, these theories, have come about because to-day we have very little historical consciousness; we pay very little attention to the conditions under which our present soul-content came into being. I have often given the classic example of this. I have often told you that to-day, when philosophers speak of the distinction between body and soul, they think they are using a concept which derives from original observation, whereas what they think about body and soul is merely the result of the decision of the eighth Æcumenical Council of 869, which raised to the status of dogma the doctrine that man must not be regarded as consisting of body, soul and spirit but of body and soul only, although some spiritual characteristics may be ascribed to the soul. In the centuries that followed, this dogma became more and more firmly established. The Schoolmen in particular were steeped in it. And when modern philosophy developed out of Scholasticism, people thought that now they were forming their judgments from experience. But they were only judging according to their usual habits, through the centuries-old custom of assuming man to consist of body and soul. This is the classic example of many situations in which present-day humanity believes that it forms an unprejudiced judgment, whereas the judgment it utters is nothing but the result of an historical event. One comes to a really sound judgment  and then not without difficulty  only by the survey of ever wider and wider historical epochs. For example, the man who knows nothing but the scientific thought of the present time quite naturally thinks it the only valid kind of thought, and is incapable of thinking that there could be any other kind of knowledge. The man who, as well as being familiar with the scientific opinion of the present time  which has hardened somewhat since the middle of the fifteenth century  also knows a little of what was accepted in the early Middle Ages, right back to the fourth century, will form his judgments about the relations of man with the world somewhat as the Neo-Scholastics do. But at most he will be able to form opinions about man's relation to intellectuality; he will not be able to form any opinion about his relation to spirituality. For he does not know that if we go back earlier than, say, Aristotle, who died in 322 B.C., we have to see ourselves in a very different spiritual configuration from the one at present prevailing, in order to get any sort of understanding as to how the men of that time thought. To try to understand Plato or Heraclitus or Thales with a constitution of soul such as we have at the present day is an utter impossibility. We do not even understand Aristotle. And anyone who is at all familiar with the discussions that have taken place in modern times about the Aristotelian philosophy knows that amidst all the waging of wordy warfare which still goes on in connection with Aristotle countless misconceptions have arisen, simply because men have not reckoned with the fact that the moment we go back to Plato, for example, who was Aristotle's teacher, we need an entirely different spiritual constitution. For if one approaches Aristotle in a forward direction, from the direction of Plato, one judges his logic differently from the way one does if one merely looks back upon it with the spiritual make-up resulting from present-day culture. Even when Aristotle was compiling his logic, which is certainly pretty abstract, very much intellectualised, he still had at least an external knowledge, even if not personal vision  there was certainly very little of that left in Aristotle  but he was still clearly aware that at one time it had been possible to see into the spiritual world, even if only in an instinctive way. And for him the rules of logic were the last utterance from above, from the spiritual world, if I may put it so. For Aristotle, accordingly, what he established as the laws or principles of logic were, so to say, shadows which had been cast down from the spiritual world  the world that was still a world of experience, a fact of consciousness, for Plato. The enormous differences that obtain between different epochs of humanity is a thing that is usually overlooked. Let us take the years from the death of Aristotle, 322 B.C., to the Council of Nicea, A.D. 325; there you have a period which it is very difficult to get to know, because the Church took care to destroy all documents that might have given a more or less accurate picture of the state of soul of those three pre-Christian and three post-Christian centuries. You have only to recall how often reference is made to-day to the Gnosis. But how do people know about the Gnosis? They know it through the writings of its opponents. Except for a very few texts, and those very far from representative ones, the whole of the Gnostic literature has been wiped out, and all we have are quotations from it in the works of its opponents, in works which are intended to refute it. We know about as much of the Gnosis as we should know of Anthroposophy if we were to make its acquaintance through the writings of Pius X. Nevertheless, out of this superficial knowledge people do hold forth about the Gnosis. But the Gnosis was an essential element in the spiritual life of the centuries that I have just mentioned, To-day, of course, we cannot go back to it. But at that particular period it was an extremely important element in European development. How can one really describe it? You see, one could not have spoken of it five hundred years earlier in the way it was spoken of in the fourth century A.D. For at that time there was still an instinctive clairvoyance, an ancient clairvoyance, there was knowledge of a super-sensible world, and one had to speak in a descriptive way out of this knowledge. The real spiritual world was always present in consciousness and was always behind such portrayals of it. Then that condition ceased. It is a marked feature of Aristotle, for example, that this super-sensible world was for him only a tradition. He may have known something of it, but, as I have already said, in the main it was tradition for him. But the concepts which he received from the spiritual world still carried the impress of that world, an impress which was lost only in the third and fourth centuries A.D. In Augustine we find no trace of the Gnosis; by his time it had quite disappeared. Thus we may say that the Gnosis is in its essence the abstract residuum often earlier spiritual knowledge; it consists of naked concepts. What lived in it was a body of abstractions. We can see this already in Philo. And one can see abstractions in the ideas of the real Gnostics, too, but their teachings were abstractions of a spiritual world that had once been seen. By the fourth century A.D. things had come to the point when men no longer knew what to make of the ideas that formed the content of the Gnosis. Hence arose the dispute between Arius and Athanasius, which cannot really be reduced to a formula. The argument as to whether the Son is of the same nature and being as the Father, or of a different nature and being, is carried on in a realm in which the real content of the old ideas has been lost. The argument takes its course no longer with ideas, but merely with words. this element that men such as Galileo, Copernicus, Kepler now went forward (though Kepler, it is true, still had some intuitions), seeking to apply an intellectualism, the spiritual origin of which had been lost, to the external world, the purely natural world. So that one can say that during its development from the fourth to the fifteenth century civilised humanity is, as it were, in labour with the intellectualism that only comes from below  an intellectualism which is fully born only in the fifteenth century, and thereafter establishes itself firmly, applying reason ever more and more to the observation of external nature, until in the nineteenth century it reaches its high-water mark in this respect. If you take what I said yesterday about the ego-sense, the thought-sense, the word-sense and so on, you will come to the conclusion that in what we now experience through these senses in our ordinary human consciousness we are actually only dealing with pictures; otherwise there could not be those perpetual discussions which result inevitably from the characteristics of the present time. Indeed, a real understanding of the essential soul-life has for the time being been lost. An example of this is the way in which Brentano's attempt to write a psychology, a theory of the soul, failed ... something which he tried to do in all sincerity. Other people of course write psychologies, because they are less honest, less candid ... but he wanted in perfect candour to write a psychology that would be worth while, and he achieved nothing of any intrinsic value, because this could only have come from spiritual science, which he repudiated. Hence his psychology remained truncated, since he achieved so little of what he was really striving for. This failure of Brentano's psychology is an historic fact of profound significance. For the jugglery with all sorts of concepts and ideas that our psychological science pursues to-day was of course for Brentano something quite empty. All these senses furnish experiences which nourish the spiritual life, when spiritual life is present in the soul. And what humanity developed in this respect was developed within the ancient eastern culture. And you understand that culture best when you understand it in the light of what I have just told you. But all this has, so to say, receded into the background of evolution. The life of the soul then lost its spirituality, it became intellectualised, and that, as I said, began in the fourth century B.C. Aristotle's compilation of abstract logic was the first milestone on the path of this despiritualisation of human soul-life, and the development of the Gnosis brought about its complete descent. And now a civilisation began that was based essentially upon the senses just enumerated. Even if you do not at first admit it, nevertheless it is so. For take the scientific spirit that emerged, the scientific spirit that tries to apply mathematics to everything. Mathematics, as I explained to you yesterday, comes from the senses of movement and of balance. Thus even the most spiritual things discovered by modern science come from the lower man. But modern scientists work above all with the sense of touch. You can make interesting studies to-day if you go into the sphere of physiology. Of course, people talk about seeing, or about the eye, or about the sense of sight; but one who sees through these things knows that all the concepts that are used are somehow conjured from the sense of touch to the sense of sight. People work with things that are borrowed, smuggled in, from the sense of touch. People do not notice it, but in describing the sense of sight they make use of categories, of ideas, with which one grasps the sense of touch. What to-day is called sight in scientific circles is really only a somewhat complicated touching; and categories, concepts such as tasting or smelling, are sometimes brought in to help. We can see everywhere at work the way of grasping external phenomena which lies behind modern ideas. For modern anatomy and physiology have already discovered  or at any rate have a well-founded hypothesis  that modern thinking really has its roots in the sense of smell, in that thinking is bound up with the brain  thus not at all with the higher senses, but with a metamorphosis of the sense of smell. This characteristic attitude of ours in our grasp of the outer world is quite different from the relationship that Plato had. It is not a product of the higher senses, it is a product of the sense of smell, if I may put it so. I mean that to-day our perfection as man does not come from our having developed the higher senses, but from our having created for ourselves a modified, metamorphosed dog's muzzle. This peculiar way of relating ourselves to the outer world is quite different from the way which befits a spiritual epoch. Now if we have to designate as oriental culture what was first revealed through the higher senses in ancient times, then what I have just depicted, in the midst of which we are now living, must be called the essence of western culture. This western culture is in essentials derived from the lower man. I must again and again emphasise that there is no question of appraisal in what I am now saying; it is merely a statement of the course of history. I am certainly not trying to point out that the upper man is estimable and the lower man less estimable. The one is an absorption into the world, the other is not. And it does not help to introduce sympathy and antipathy, for then one does not reach objective knowledge. Anyone who wishes to understand what is contained in the Veda culture, the Yoga culture, must start from an understanding of these things, and must take this direction (see diagram, upper man). And whoever wishes to understand what is really to be found in its first beginnings, what has to be more and more developed for certain kinds of human relationships, what indeed in the nineteenth century has already reached a certain climax, has to know that it is particularly the lower man that is trying to emerge there, and that this emergence of the lower man is especially characteristic of the Anglo-American nature, of western culture. A spirit specially representative of the rise of this culture is Lord Bacon of Verulam. In his Novum Organum, for instance, he makes statements  statements very easily misunderstood  that at bottom can have meaning only for superficial people. And yet what he says is extraordinarily characteristic. Bacon is in a certain respect both ill-informed and foolish, for as soon as he begins to speak of ancient cultures he talks nonsense; he knows nothing about them. That he is superficial can be demonstrated from his own writings. For instance, where he speaks about warmth  he is an empiricist  he gathers together everything that can be said about warmth, but one sees that he gets it all from notes of experiments. What he has to say about warmth, he did not find out for himself, but it has been pieced together by a clerk, a copyist, for it is a frightfully careless piece of work. Nevertheless Bacon is a milestone in modern evolution. 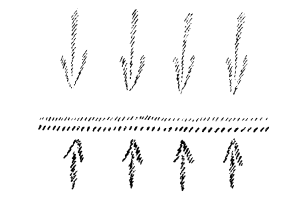 One may dismiss his personality as of no interest, but yet through all his ineptitude and through all the rubbish that he again and again gives out, something continually gets through that is characteristic of the emergence of a culture that corresponds with what I have described here (see diagram, lower man). And humanity will not be able to emerge from the poverty of soul in which it is now living if it does not grasp that  for reasons which previous lectures will have made sufficiently clear  it was possible to live with the culture of the upper man, but it will not be possible to live with the culture of the lower man. For after all, man brings his soul with him into each new incarnation, a soul which has unconscious memories of earlier lives on earth. Man is ever and again urged towards what he has outlived. To-day he often does not know what it is that he is being driven towards. This urge consists in a vague longing; it is sometimes quite indefinable, but it is there. And it is there above all because one comes gradually to regard what belongs to this sphere (see diagram, lower man) as something objective, since it can be grasped in terms of laws. All that exists of a more traditional nature, and belongs to this sphere (see diagram, upper man) has, as regards its real nature, faded away into belief. And although people are at a loss how to attribute real existence to this moral content of the soul, and turn to faith as the only support for knowing anything about it, nevertheless they try to cling to it. But, my dear friends, it is not possible for humanity nowadays to go on living with this cleavage in the soul. One can still argue that the evangelical antithesis, the opposition between faith and knowledge which has been elaborated particularly in the evangelical denominations, can be maintained as a theory; but it cannot be applied to life, one cannot live by it. Life itself gives the lie to such an antithesis. The way must be found to assimilate morality with that to which we ascribe real being, otherwise we shall always come to the point of saying: Natural necessity provides us with ideas about the beginning and the end of the earth; but when the end decreed by the scientists has arrived, what is to become of everything to which we ascribe human worth, of all that man attains inwardly, morally ... as to what is to become of that, how it is to be rescued from the perishing earth, all this has to be left to faith! And it is interesting to note that it is just from this standpoint that Anthroposophy is attacked. Perhaps at this point I may be allowed to mention this attack, because it is typical; it does not emanate from one person, but from a number of people. They find that Anthroposophy claims to have a content of knowledge, and thus can be treated like scientific knowledge. Simpletons say of course that its content cannot be compared with scientific knowledge, that it is something else  well, that is self-evident, there is no need to mention it; but it can be treated in the same way as natural scientific knowledge. Many people also say that one cannot prove it. Those people have never made themselves acquainted with the nature of logical proof. But the main point is that people say that the things of which Anthroposophy treats ought not to be the objects of knowledge, for this would deprive them of their essential character. They must be objects of faith. For it is only in the fact that we know nothing of God, of eternal life, but only believe in these things, that their true value lies. And indeed such knowledge is assailed on the ground that it will undermine the religious character of these truths; for their sacredness is said to lie in the very fact that in them we believe something about which we know nothing. The very expression of our trust lies in our ignorance. I should very much like to know how men would get on with such a concept of trust in everyday life, if they had to have the same trust in those about whom they knew nothing as in those of whom they knew something ... at that rate one should no longer trust the divine spiritual powers when one gets to know them! Thus the essence of religion is supposed to consist in the fact that one does not know it, for the holiness of religious truths suffers injury when one converts those truths into knowledge. That is what it comes to. If one pays any attention to the worthless scribbling that goes on, then every week one sees in print things that are reduced to nonsense if one analyses them into their original elementary constituents. To-day one must not ignore these things. I must again and again stress this, and I do not hesitate to repeat myself. For instance, when a respectable newspaper in Wurttemburg publishes an essay on Anthroposophy by a university lecturer who writes, This Anthroposophy maintains that there is a spiritual world in which the spiritual beings move about like tables and chairs in physical space, when a university don to-day is able to write such a sentence, we must leave no stone unturned to discredit him; he is impossible: nonsense in responsible quarters must not be allowed to pass. It is only when anyone is drunk that he sees tables and chairs move, and then only subjectively. And since Professor T. would neither admit that he was drunk when he wrote his authoritative article, nor that he was a spiritualist  for tables and chairs do move for spiritualists, even if not of themselves  then one is justified in saying that here we have an example of the most thoughtless nonsense. And by having written such nonsense, the Professor undermines confidence in all his knowledge. To-day we must make it our bounden duty to treat such things with the utmost severity. And we shall become more and more entangled in the forces of decadence if we do not maintain this severity. We meet with utterly incredible things to-day, and the most incredible things get by, since we perpetually find excuse after excuse for the trickeries that are committed in so-called authoritative circles. To-day it is absolutely necessary to lay stress upon the importance of reaching clear ideas, full of content, in every sphere. And if one does this, then the doctrine of the separation between knowledge and faith cannot be maintained, for then it would be reduced to what I have just now pointed out. But this distinction between knowledge and belief is something that has been brought about only in the course of history. It has come about partly for reasons which I have already mentioned, partly on account of something else. Above all, the following must be taken into consideration. To begin with, there is what came about in western Christianity in the first Christian centuries through the fusing of the Gnosis with the monotheistic Gospel teaching, and then there is the fusing of Christianity with the Aristotelianism that arose in the time of the Schoolmen  certainly in a highly intelligent way, but nevertheless merely as historical recollection. And this doctrine, the doctrine of the uniform origin of both body and soul through birth or conception, is a thoroughly Aristotelian doctrine. With the casting off of the old spirituality, with the emergence of pure intellectuality, Aristotle had already been divested of the notion of pre-existence, the notion of the life of the human soul before birth, before conception. This denial of the doctrine of pre-existence is not Christian; it is Aristotelian. It first became a dogmatic fetter through the introduction of Aristotelianism into Christian theology. But at this point an important question arises  a question which can be answered to some extent from the substance of the lectures I have given here in recent weeks. If you remember much of what I have lately been saying, you will have come to the conclusion that the materialism of the nineteenth century is in a certain sense not wholly unjustified (I have repeatedly stressed this). Why! Because what confronts us in the human being, in so far as he is a physical-material being, is an image, a reproduction, of his spiritual evolution since his last death. What develops here between birth and death is not in fact the pure soul-spiritual; it is the soul-physical, a copy. Out of man's experiences between birth and death there is no possibility of acquiring a scientific conception of life after death. There is nothing which offers a possible proof of immortality, if one looks merely at the life between birth and death. But traditional Christianity does look only at this life between birth and death, for it regards the soul as well as the body as having been created at the time of birth or conception. This viewpoint makes it impossible to acquire knowledge about life after death. Unless one accepts the existence of life before birth, knowledge of which can, as you know, be acquired, one can never obtain knowledge of life after death. Hence the cleavage between knowledge and belief as regards the question of immortality arises from the dogma which denies the life before birth. It was because men wanted to drop the knowledge of pre-natal life that it became necessary to postulate a special certitude of faith. For if, whilst denying pre-natal life, one still wishes to speak of a life after death, then one cannot speak of it as scientific knowledge. You see how systematically ordered the dogmatic structure is. Its purpose is to spread darkness among mankind about spiritual science. How can that be done? On the one hand by attacking the doctrine of life before birth ... then there can be no knowledge about life after death, then men have to believe it on the basis of dogma. The fight for belief in dogma is waged by fighting against knowledge of life before birth. The way dogma has developed since the fourth century A.D., and the way modern scientific notions have developed without interruption out of dogma  it is all extraordinarily systematic! For all these scientific ideas can be traced back to their origin in dogma, only they are now applied to the observation of external nature, and it can be shown how thereby the way has been paved for man's dependence upon mere belief. Because man will have some relationship to immortality, he is deprived of his knowledge  for he has been deprived of it  and then he is open to dogmatic belief. Then dogmatic belief can seek out its kingdom. This is at the same time a social question, a question relevant to the evolution of humanity, a question that has to be clearly faced to-day. And it is the crucial test, not only of the value of modern culture, hut also of the value of the modern scientific spirit, and of humanity's prospects of recovering the strength to rise, to climb up again.